You might think that I was finished with bison photos- I see them every time I go to Yellowstone, after all. However, on this last visit I saw got to see bison doing something I knew they did, but had never viewed. On the last day of our visit (the same day we saw the bighorn sheep), my son-in-law pointed out a small herd of bison crossing the Gardiner River. This is probably a typical sight for him, but, for me, it was something new to photograph. Every time we made the short drive from Yellowstone to Gardiner, Montana, we would see bison gathered at the river munching on the grasses. The steam rising from the water gives a misty appearance to the scene, contrasting with the icy banks. We stopped several times to take photos; I never get tired of this scene! Yes, we are back home from Yellowstone! We actually arrived in Phoenix last night, but we spent the night and did some shopping before heading up the hill this afternoon. We got home an hour ago- and we’re already unpacked, the laundry is going, my photos are uploading (still! ), and my husband is out at the store picking up something for tonight’s dinner. I took a ton of photos (darn burst mode! ), and it will take a week or so to go through them. Expect to see some darling boys (and dogs), some elk (of course), more bison, lots of snow, the hot springs, and some photos of one of my bucket list animals (a very common one at Yellowstone that had thus far eluded me)! Greetings from Yellowstone! We are having such a great visit with our little Yellowstone family! 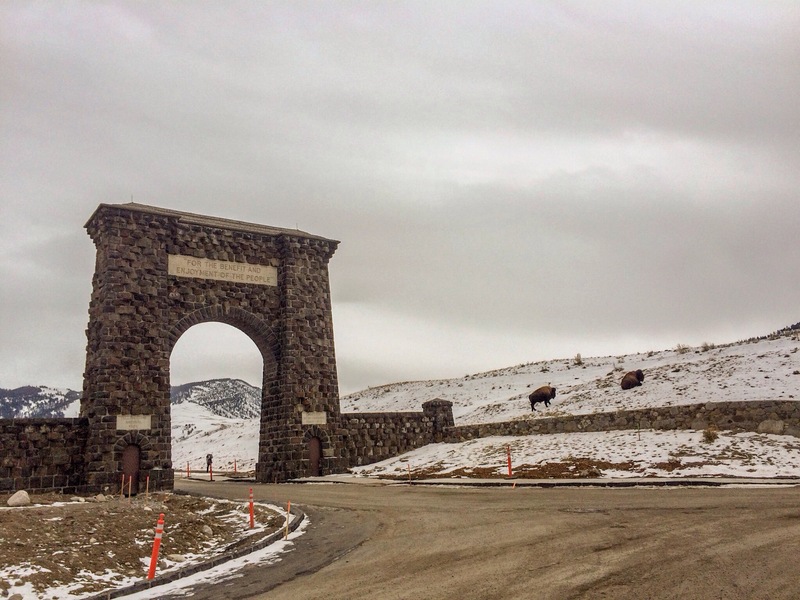 The photo above (taken with my iPhone) is of the historic Roosevelt Arch in Gardiner, Montana at the North Entrance to Yellowstone National Park. Miles’s school is nearby, and I snapped this photo after we met him for lunch. I have issues uploading photos from my 64GB card to the iPad, so you’ll have to wait til next week for more Images of Yellowstone and the boys. I’m used to being surrounded by elk at my daughter’s house here in Yellowstone, but yesterday we had a special visitor! It was pouring rain, but I managed to take this photo through the latticework on the back porch. Yes, he saw me, but I was very far away and using a zoom lens. I chose to edit this photo in black and white, because a bison just doesn’t look right on a bright green lawn!